A burgundy body velvet Christmas stocking with a white fold down cuff. The Christmas stocking is embroidered with white embroidery thread, with the words Merry Christmas, artfully designed in the shape of a Christmas tree. White beaded snowflakes are falling around the tree. The tree is topped with a metallic silver star and decorated with sparkling jewels. This Christmas stocking is 19 in. long and 8 in. wide, has a red velvet back and a lined front. 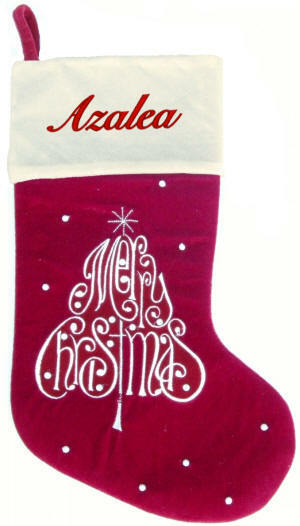 This decorative Christmas stocking is not a toy or intended for use by a child under 14.